Elizabeth Gilbert should have named the book Eat, Pray, Eat. 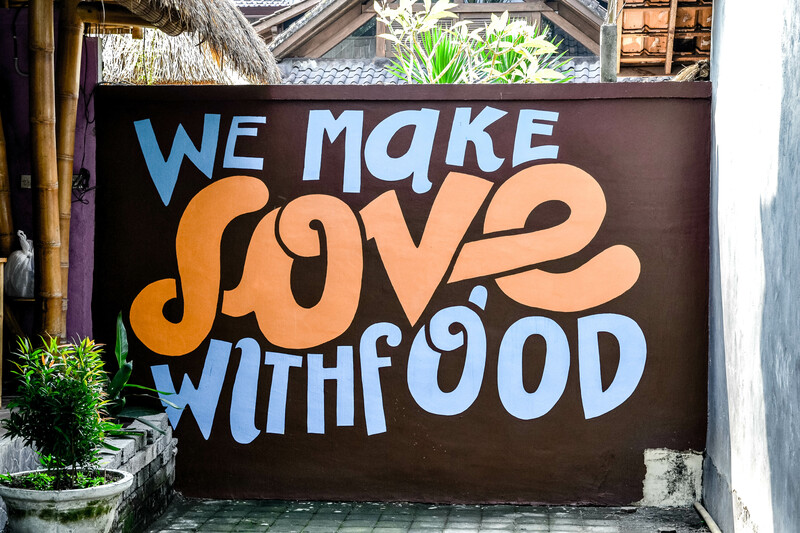 Ubud may be the mindfulness capitol of Bali, but we spent more time in Eat Like a Pig position than Downward Dog. My ex-coworker and Varsity Foodie friend, Otty, is from Indonesia and he equipped me with a proper checklist of fine culinary experiences to hunt down. We hit them all and added a few to the list. Be warned, you may salivate on your keyboard reading this. In no particular order, here are the Must Eats. Vegetarians, your journey ends here. 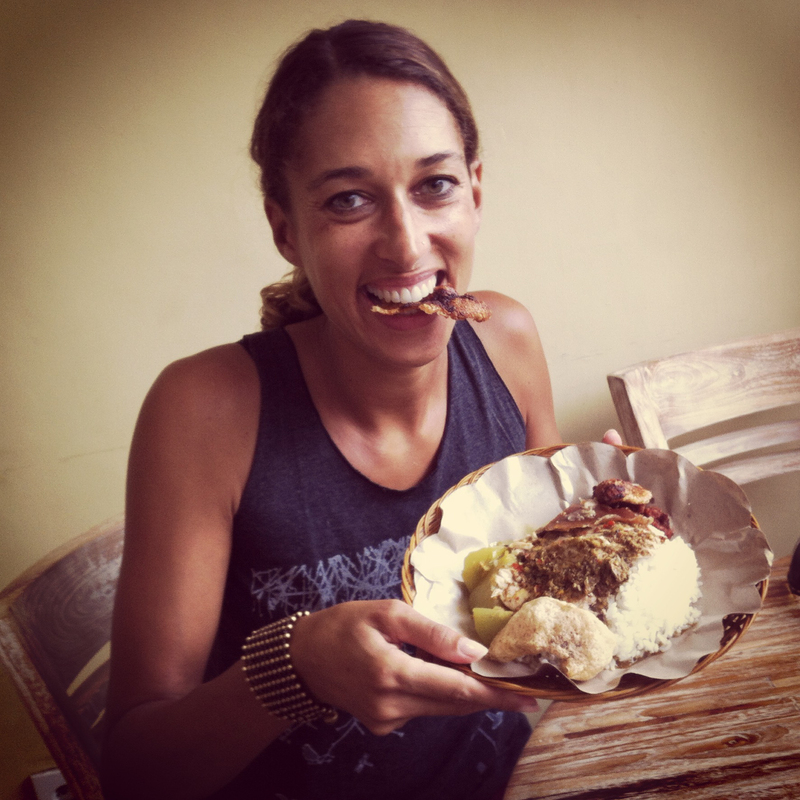 Anthony Bordain once claimed that this is the best pork he had in his life. I’m still in denial about what this really is, and am going to continue to tell myself it means “finger licking good” pig. If you are down to dig on some swine, plan your day around Ibu Oka. Six pigs are delivered by motorcyle at 11am and the restaurant stays open until the last plate is served. There are several locations now since seating fills up quickly, but we went twice and never waited more than ten minutes. 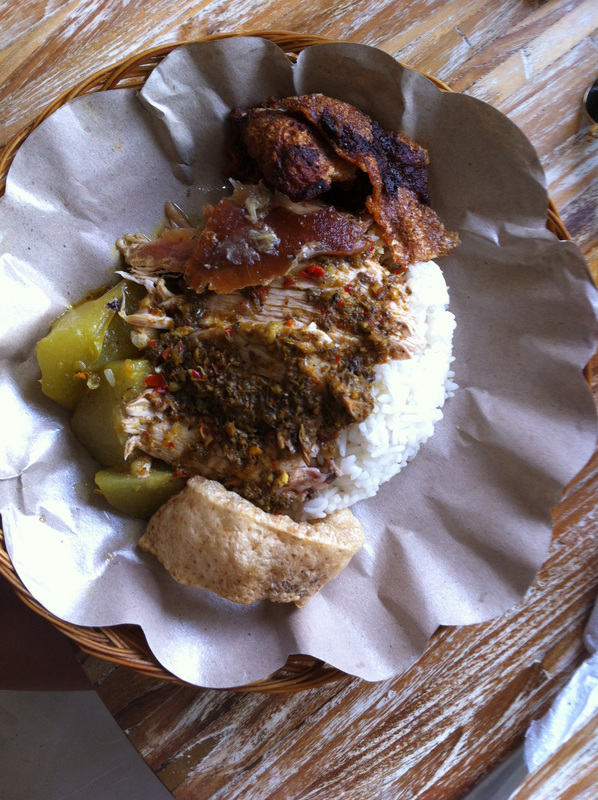 Get the “special” plate to sample all they have to offer: a slice of crispy skin tops the slab of fatty pork meat you get with the dish, and the steaming hot rice helps soak up the spice from the slice of blood sausage and spiced vegetables. YUM. 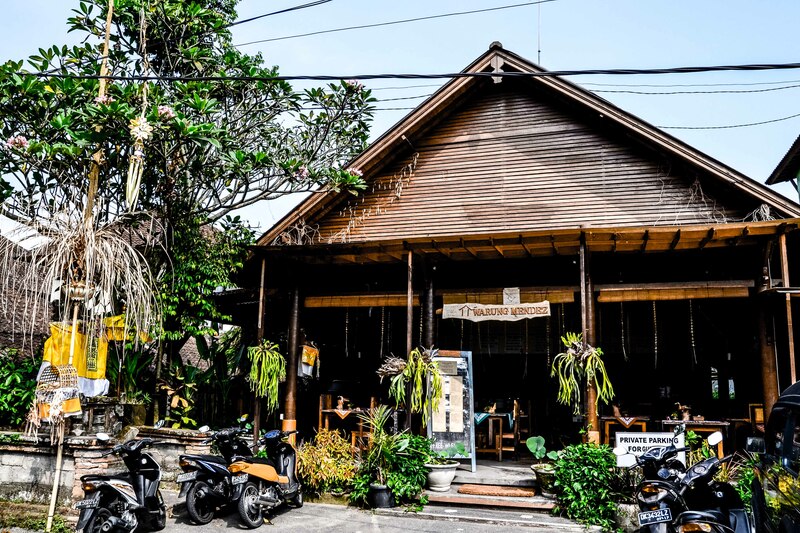 We stumbled upon Warung Mendez (no, it’s not Mexican) near our amazing Airbnb rice field house rental which is sadly no longer available. I fell in love with this place and we ate here at least four times. The roast goat is to die for, rich and succulent, with an assortment of dipping sauces. BBQ chicken, spring rolls and fresh juices are pure joy. This place is empty at lunch and packed at dinner. So good, and very reasonably priced. Located near Alchemy (raw food restaurant we never tried) which any taxi driver should know. 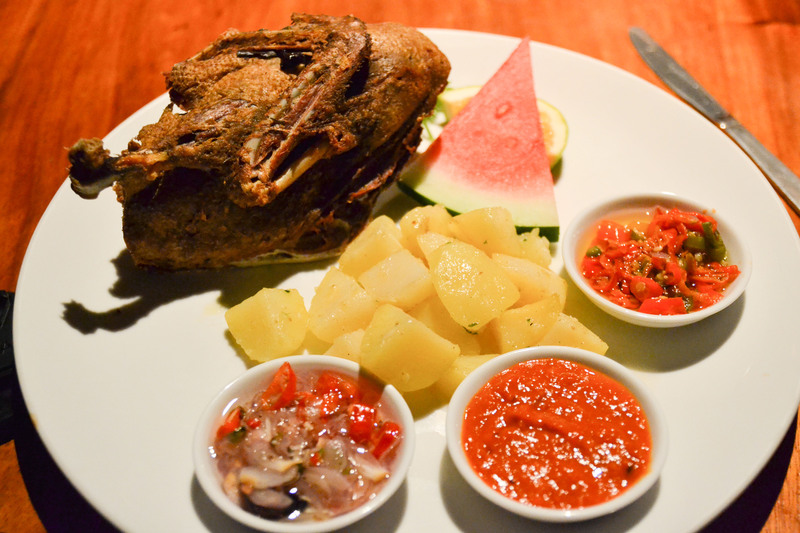 Bebek Bengil is the place to go. Crispy fried “Dirty Duck” in a gorgeous restaurant on the edge of the rice field. Bit on the pricey side but if you make a reservation you can get a a little nooked out area all to yourselves with cushions and mood lighting. Don’t bother with the appetizers, they’re all subpar. Just get the duck. Centrally located this is a great option for dinner. Be on the lookout for lemongrass gelato, knocked my socks off. Lime or Lemon Squash cocktails at happy hour are also a must. 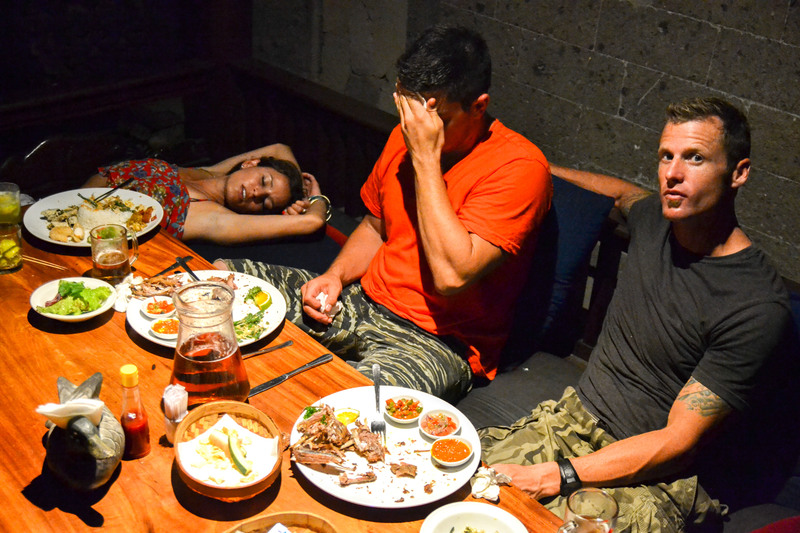 Don’t be afraid to eat your way through Ubud, then come to mindful resting position in food coma pose. Ooohh, I’ll have to try that next time! Yum yum double yum! 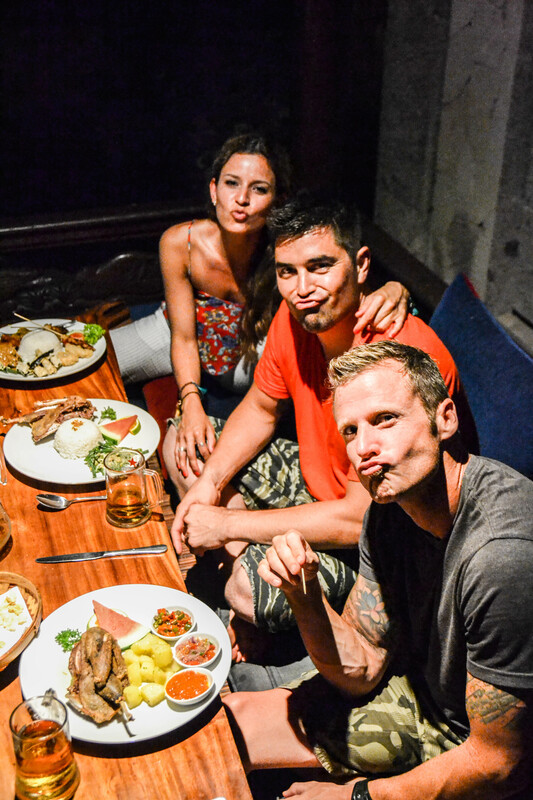 Love the food coma pose and can’t wait to try all if and when I finally get to Bali! Thanks for the recs! You convinced me to go to Ibu Oka. 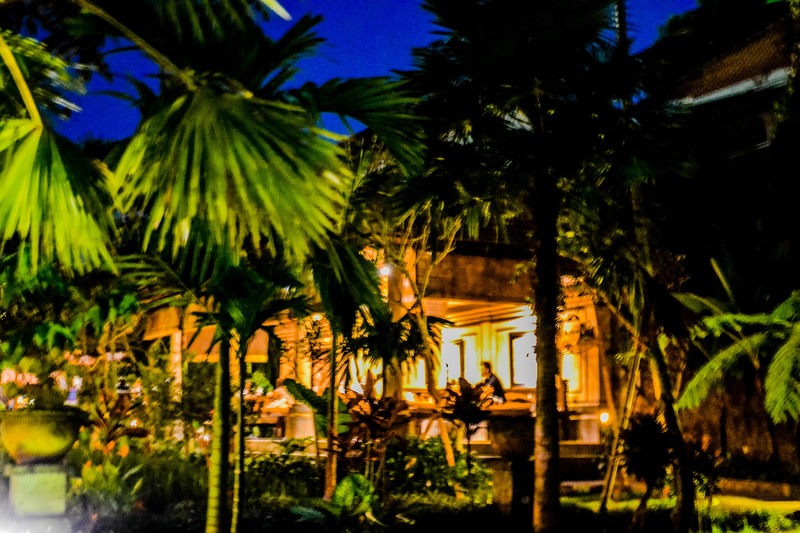 If you go back to Ubud, GO TO CLEAR CAFE! I hear it burned down last year but they have a new temporary location that’s a little bit of a walk, but so worth it. It’s probably one of my fave restaurants in the world now, no joke. Thank you! I’ll definitely check out Clear Cafe next time. 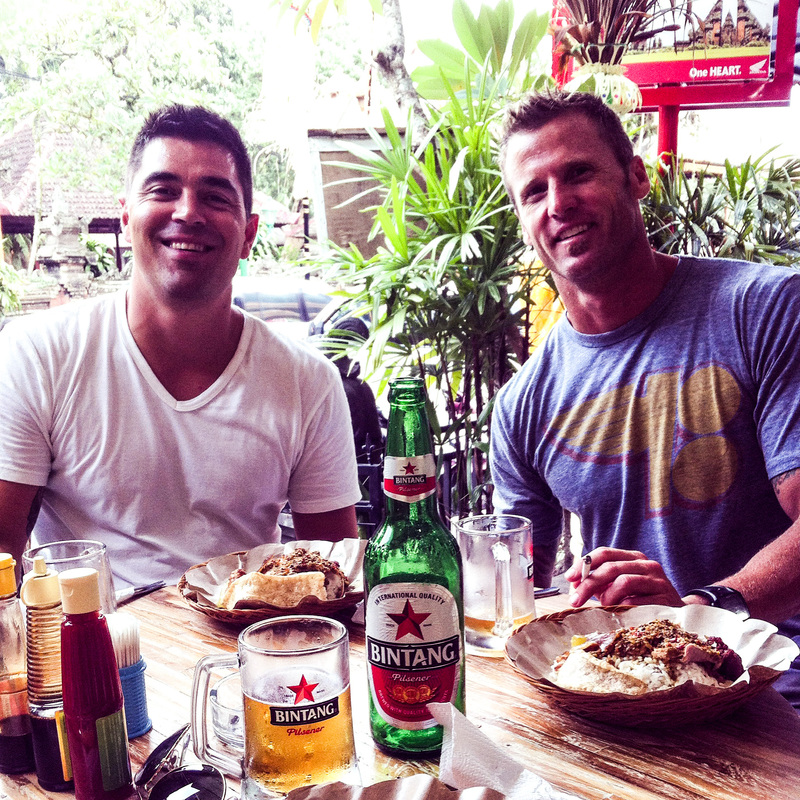 Hope you enjoyed Ubud!